New year, new you is a common theme plastered all over social media starting in the beginning of January. However, according research from to the University of Scranton, only 8 percent of people actually achieve their New Year's goals. If getting healthy and fit made your list, the retailers below will give you just the fitspo you're looking for, even if it's means solely showing up at the gym to look good in your new threads. You have at least taken the first step. Achieving goals is something to get excited about like a first date, a trip or landing a promotion. Getting fit doesn't have to feel like a chore. A new activewear wardrobe to choose from will not only help you look the part, but it will also put you in the right mindset to meet whatever challenges come your way. Since GAP was founded in 1969, its signature pieces have become staples in every wardrobe. Clean and confident, comfortable and accessible, classic and modern. When GAP, Inc. acquired Athleta in 2008, it was only a matter of time before it started dabbling in activewear. Four years later, GapFit was born. Today, GapFit outfits women who run, practice yoga and attend barre classes. The collections include leggings in solids, prints and cutouts; breathable tops, low- and medium-impact sports bras and stylish outerwear. With all the success Kayne West is having at Adidas, maybe becoming "The Steve Jobs of the GAP" isn't too far off. When H&M announced the evolution and growth of its H&M Sport concept in January 2014, fast fashion shoppers had reason to celebrate. For the new collection, H&M collaborated with the Swedish Olympic team so that the clothes were not only fashionable but also had an emphasis on performance. 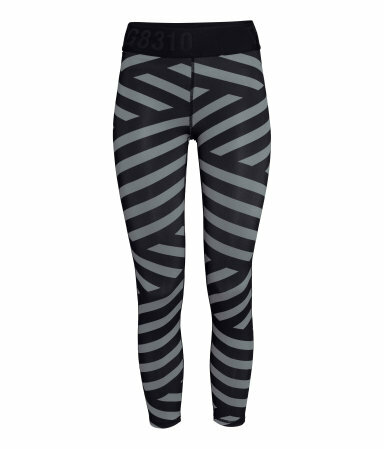 H&M Sport offers pieces for running, cross-training, yoga and the outdoors. Functionality and comfort are key to the design, such as the different support offered by three types of sports bra, while colors run from black, white and greys to hot pink. Department stores are not the usual go-to when shopping for activewear, but they should be. Macy's houses all the big dogs like Nike, Under Armour, Adidas and Puma under one roof. Plus, brands like Calvin Klein, Betsey Johnson and Trina Turk whose activewear collections don't garner as much attention as their ready-to-wear clothes. With more then 30 brands in Macy's activewear department, it carries anything that aids in breaking a sweat. Revolve is an e-commerce site started in 2003, offering fashion items from more than 500 emerging designers with an LA vibe. It caters to fashion and social media savvy women who have plenty of occasions to get dressed up and go out. Revolve gives a fresh take when the big brands just aren't cutting it anymore. Consider it a new activewear mecca for unique, fashion-forward pieces that don't skimp on performance details. From jumpsuits to chic two-piece ensembles, Revolve is sure to spice up any gym wardrobe.